Inspire You in Your Divine Calling as a Wife and Mother. Available right now and it's on sale too - Go Ahead and Order Today. Order your copy of "100 Days Of Blessing" for Only $14.95 (plus shipping). This book is a wonderful devotional for new mom's that are slightly overwhelmed with their new schedule while carrying for their precious little one. It is also a wonderful study to help keep your focus on our number one task given to us by the Lord as mothers and wives to disciple our children and provide a peaceful haven for our whole family. Great for a young mothers bible study. This is a fabulous way to start my mornings. A must for every woman's library. This devotional is so good, I find myself reading it two or three times a day. I have been so blessed thus far reading Mrs. Nancy's 100 Days of Blessing. It has been soul nourishment for this wife and mother, and exactly what I've needed to hear. Each devotion has led me back to the Truth of God's Word and God's purpose for wives and mothers, and the joy in fulfilling that call. In a culture where popular and trendy counsel seems to be the norm, the wisdom in this book may not be what you want to hear, but what you need to hear! So REFRESHING! Thank you! What we all need daily as mothers. 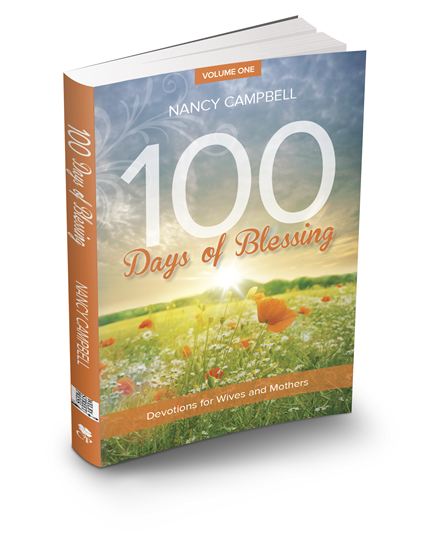 Click the button below to add the 100 DAYS OF BLESSING - VOL 1 to your wish list.